Anna Mae Herring, 84, passed away on Monday, March 25, 2019 at Keystone Villa in Blandon. Born on November 28, 1934 in Pine Grove, she was a daughter of the late Edwin and Dorothy Granger Brown. She was a member of Grace Bible Fellowship Church, Reading. Anna Mae and her husband enjoyed power walking with other couples. 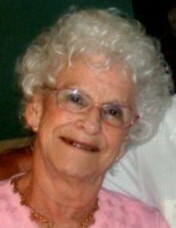 She also loved painting, crafting, ceramic and her grandchildren. Preceding her in death were three brothers, Donald Brown, Arnold Brown, and Landis Brown. Surviving are her husband of 66 years, Sterling E. Herring; two daughters, Debra and husband Jack Sensenig of Sinking Spring, Wanda and husband Kirk Weinman of West Lawn; 6 grandchildren, Kristy, Jason, Nicole, Ashley, Zachary, and Andrew; 5 great grandchildren, Brianna, Adalynn, Devon, Gavin and Landon; brother, Larry "Chico" Brown of Pine Grove. Funeral Services will be held on Friday, March 29 at 2:00 P.M. at the H. L. Snyder Funeral Home, Inc., Pine Grove with Rev. Randall Grossman officiating. There will be a viewing on Friday, March 29, 2019 from 1:00 P.M. until 2:00 P.M. at the Funeral Home. Interment will follow in the Schuylkill Church of the Brethren Cemetery, Pine Grove.